Bob Elliott, one half of the comedy duo Bob And Ray, has died at age 92. With his late partner, Ray Goulding, who died in 1990, Elliott spent decades perfecting a specific kind of humor: bone-dry, low-key, often bracingly dark, and completely absurd and surreal. Bob And Ray’s countless characters are capable of saying the most ridiculous things in the most matter-of-fact way, whether they’re describing a preposterous business plan, nattering on about a silly and impractical hobby, or trying to sort out the details of an incredibly convoluted soap opera plot. The duo’s influence can be felt on The Simpsons, in the comedy of David Letterman, and in TV sitcoms and sketchcoms too numerous to count. 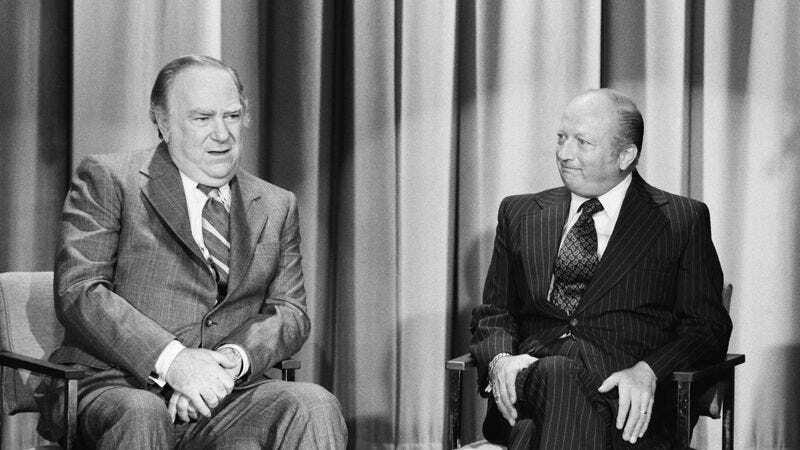 Though they branched out into other media, including television, live theater, and even film, Bob And Ray truly made their mark in the radio. There are so many hours of audio that it is difficult to know where to begin, but one particularly fine showcase for their talents is a 15-minute program called Bob And Ray Present The CBS Radio Network, which aired from 1959 to 1960. Here, listeners will be able to find episodes of such beloved mock soap operas as “One Fella’s Family,” “The Gathering Dusk,” and “Grand Motel,” an establishment whose strict policy concerning continental breakfasts causes no end of grief. The CBS Radio Network is also where the duo unfurled one of their greatest running jokes: Smelly Dave, a rotting whale carcass supposedly sent from town to town on a railroad flatcar as some kind of spectacularly ill-conceived publicity stunt. As one would expect, this program also features numerous appearances by Bob Elliott’s most famous character, the hapless yet proud reporter Wally Ballou. By this point in their career, Elliott and Goulding were also branching out into advertising, and their animated spots for Piel’s Beer remain amusing showcases for their brand of humor. In the ads, Elliott provided the voice of Harry, the calmer and more reasonable brother of brash Bert (Goulding). Though they were never able to sustain any television vehicle for long, radio being their true home, Bob And Ray did manage to snag the occasional network showcase in the 1950s. On the tube, rather than playing all the parts themselves, they would occasionally be joined by other actors. In so doing, they even worked with Audrey Meadows, best known as Alice Kramden on The Honeymooners. Some of their best television appearances, however, arrived when then were invited to perform their act on late-night talk shows. Johnny Carson loved Bob And Ray and booked them on The Tonight Show many times. Here they are, for instance, doing their classic “Most Beautiful Face Winner” routine, in which Elliott is the highly unlikely title-holder but remains humble despite his overwhelming attractiveness. Bob And Ray also managed to translate their act to the live stage, most famously in the Broadway hit The Two And Only, where they played some of their best-known routines to a highly appreciative audience. The show includes such golden oldies as “The Slow Talkers Of America,” in which Elliott’s halting diction proves absolutely torturous for Goulding. Latter-day audiences, meanwhile, will probably remember Bob Elliott best for the work he did with his son, Chris, in such projects as Get A Life and Cabin Boy. When Chris was hired as a writer and performer for Late Night With David Letterman in the 1980s, he knew he owed his success somewhat to the high esteem in which Letterman held Chris’ famous father. Once Chris established himself as a comedic talent in his own right, he repaid the favor by writing in parts for Bob. Father and son appeared together on Later With Bob Costas to discuss their relationship, both on screen and off.